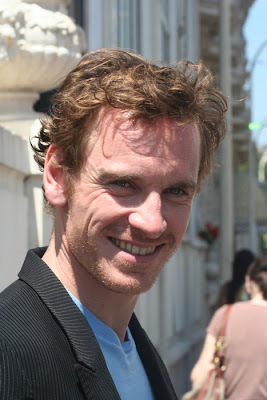 Fassinating Fassbender - A Michael Fassbender Fan Blog: More excellent Cannes pictures of Michael found! More excellent Cannes pictures of Michael found! This is just one of a nice small bunch of photos from Cannes that Alice at MFO found today, or yesterday. I just love these candid smiley ones. The man is perpetually happy! What kind of vitamins does he take, or type of tea he drinks? I want some! I want to be happy all the time just like Michael Fassbender! Oh, and my FF banner Creative Director Steve is working on the new banner, so it may be up some time this week. Be on the look out!